In 2014, there were about 482,000 commercial or institutional buildings in Canada, representing a total floor area of 800.8 million square metres. These buildings consumed a total of 911.2 million gigajoules of energy. Commercial and institutional buildings in Ontario accounted for 35.6% of buildings in Canada and represented 42.9% of the total floor area. These buildings consumed the highest share of energy in Canada, at 41.6%. 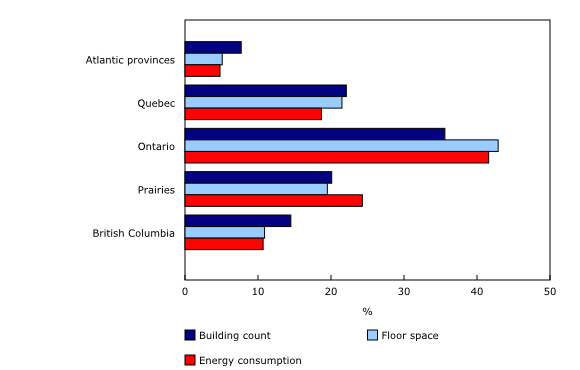 Buildings in the Atlantic provinces represented 7.7% of buildings in Canada, accounted for 5.1% of the total floor space and consumed the lowest regional share of energy consumption, at 4.8%. Buildings in the Prairies region reported the highest energy intensity of any region, at 1.41 gigajoules per square metre (GJ/m2), while those in Quebec had the lowest energy intensity, at 0.99 GJ/m2. Hospital buildings (2.45 GJ/m2) had the highest energy intensity levels among all building types, while warehouses (0.82 GJ/m2) had the lowest, followed by primary and secondary schools (0.88 GJ/m2). Data in this release are from the 2014 Survey of Commercial and Institutional Energy Use, which is a survey of establishments and their buildings. Data from a supplemental warehouse questionnaire were incorporated into the estimates. The survey was designed to produce data at the regional level. The 2014 Survey of Commercial and Institution Energy Use produced two sets of data on the energy consumption patterns of Canadian businesses, organizations and institutions. The survey collected data on the types and quantities of energy (such as electricity and natural gas) consumed by businesses and institutions in Canada, and by their buildings. To be in-scope for the establishment component of the survey, an establishment must have rented, owned or occupied space in a commercial or institutional building, had at least one employee, and been in operation in 2014. Establishments located in the territories (Yukon, Northwest Territories and Nunavut) were excluded. For a building to be in-scope for the building component of the survey, at least 50% of its space must have been used for commercial or institutional purposes in 2014. Military bases and embassies were excluded. A gigajoule is a unit of measure for energy consumption equivalent to one billion joules; six gigajoules are roughly equivalent to the amount of potential energy in one US standard barrel of oil when consumed. Energy intensity is the total energy consumed expressed in gigajoules divided by total floor area expressed in square metres. Higher energy use per square metre of floor space is considered more energy intensive. For more information about energy use in the commercial and institutional sectors, contact Marie-Lyne Tremblay (343-292-6382; marielyne.tremblay@canada.ca), Natural Resources Canada.